What Happens next: The NFLPA and Brady can drop the case, have Brady serve the suspension and Deflategate is essentially over. Or, and based on the way this case has gone, the NFLPA can petition that the case be heard en banc, which is, that the case will be heard by all 13 judges that comprise the 2nd Circuit Judicial Council. This petition is very rarely granted, but there is some hope for Brady as the Chief Judge was the dissenting voice on the 2-1 Decision. If the petition is denied, or granted and ultimately the 3-judge panel decision is affirmed, the NFLPA and Brady could only hope to take their case to the SCOTUS; which would never happen; although in this case, never is too strong a word. Timeline—January 19, 2015: Patriots vs. Colts AFC Championship game; Bob Kravitz reports NFL is investigating the Patriots used deflated footballs. Patriots cruise to easy victory en route to Super Bowl. January 21: ESPN’s Christ Mortensen publishes inaccurate story about the deflated footballs. February 1: Patriots defeat Seahawks 28-24 in Super Bowl IL. May 6: Wells Report is released. Millions of dollars spent on investigation. Report includes information that Brady destroyed his cell phone, incriminating text messages between Patriot ballboys, one of whom is referred to as the “deflator”, and the conclusion that it was “more probable than not Tom Brady was at least generally aware,” of the deflating of football scheme. May 11: Brady is suspended 4 Games by Commissioner Goodell. Patriots are fined $1M and lose their 1st and 4th round picks. May 14: Brady appeals suspension. Five days later Kraft accepts the patriots’ penalties. 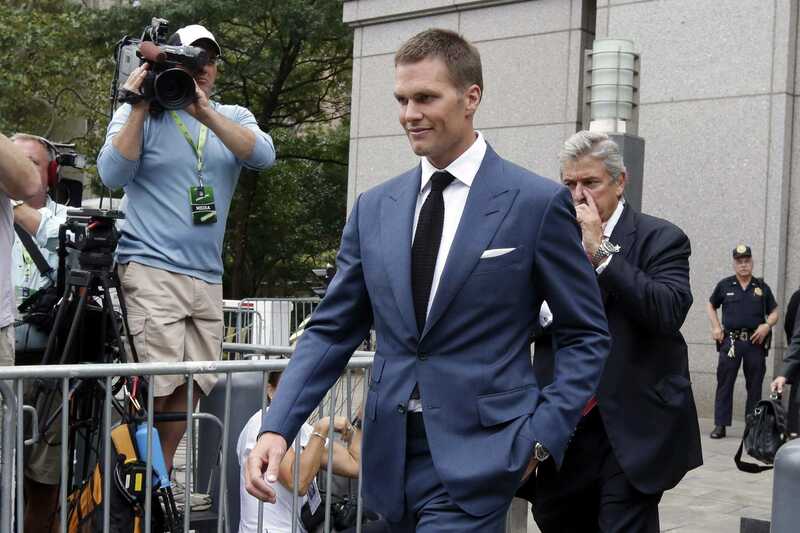 June 23: Brady’s appeal is held in New York City. Goodell serves as the arbiter per language in the CBA, despite NFLPA requesting a neutral arbitrator be used. July 28: Goodell upholds Goodell’s decision to suspend Brady for four games. Says Brady is active in the deflating scheme, not just generally aware. Appeal to be heard before the US District Court for Southern District of NY; Judge Richard Berman to decide. August 4: Over a thousand Brady emails are leaked. Brady insults Manning and pool cover co.
August 30: Third of three settlement hearings between the NFL and NFLPA is held. Sides cannot agree. Popular opinion was Brady would agree to a 1-game suspension. April 25: Suspension reinstated. 3-Judge panel overturns Berman’s decision to vacate, 2 votes to 1, with Chief Judge Katzenburger dissenting.